PreSonus' Studio One 3 features everything you'd expect from a modern digital audio powerhouse, but once you use its flow-oriented drag-and-drop interface, you'll realize Studio One 3 was built by creative people for creative music production. From set up, dialing in sounds, recording, sequencing, arranging, and sonic experimentation to mixing, mastering, and even online delivery, Studio One 3 was designed to keep you inspired and in the flow—focused on your music first. In just three short years, Studio One has taken the music production world by storm and is heard today on countless hit recordings. It has been one of the most widely-adopted digital audio workstations in professional and project studios worldwide due to its revelatory ease of use and uncompromised 64-bit sound quality. 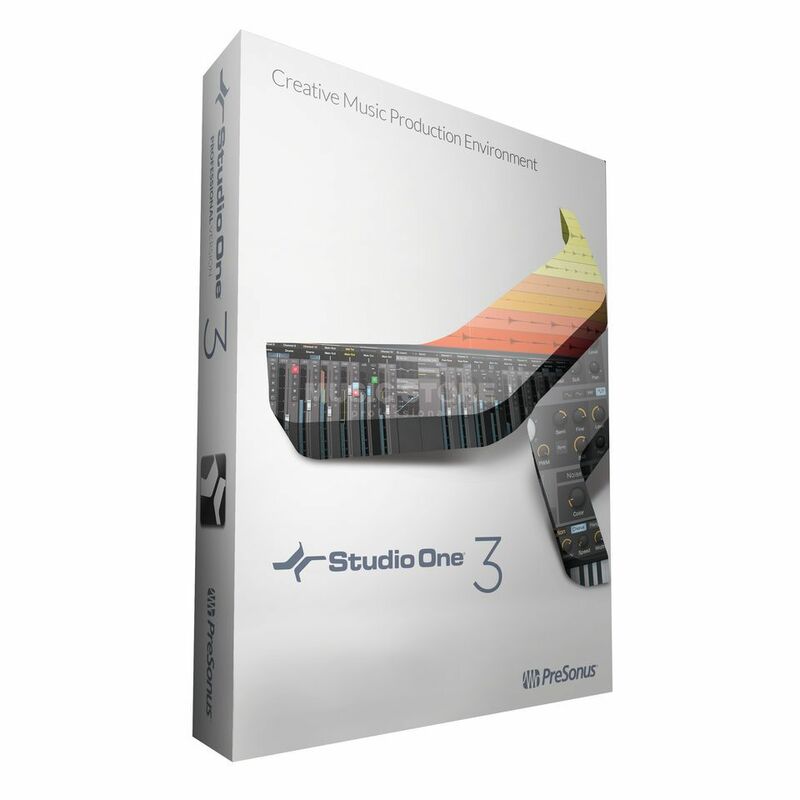 With version 3, Studio One introduces innovative songwriting and production tools, inspiring new ways to craft unique and evocative sounds. Innovative songwriting and production tools: On-the-fly Arranger Track with Scratch Pads for experimentation; NoteFX including: Arpeggiator, Chorder, Repeater and input Filter; Step Recording for beat and track programming. Inspiring Sounds: Build unique, layered sounds with Multi Instrument and parallel processing, Extended FX Chains; PresenceXT Sampler with 15GB sound library (EXS, Kontakt, Giga support), Mai Tai polyphonic analog modeling synth. BitCrusher and Rotor Native Effects. Improved sound quality with Elastique 3.0 time stretch and pitch manipulation. Find samples, loops (over 2000 included), and presets fast with "musical search" keyword-driven Browser and integrated online PreSonus Shop. Hands-on control: Multi-touch support; Studio One Remote for iPad®; Automation Curves; powerful, definable Macro Controls; smart user-definable tools palette; and a re-engineered console for more accurate and intuitive mixing. Not just a pretty face: Stunning new interface optimized for high-DPI displays that not only looks good, but also offers help when andwhere you need it through dynamic, context-sensitive documentation, help, and tool-tips. Pristine sound quality with a critically acclaimed mix engine, new synthesis engine, native 64-bit resolution and support for up to 384 kHz audio. Mai Tai polyphonic analog modeling synth with character morphing, modulation matrix, and zero feedback filters. Import Notion stems with instrument names, mix, and tempo info preserved.